Coach's Corner - "Queen" band signed/certified record album. Go Back to Lot List "Queen" band signed/certified record album. This vintage LP is "The Game" and shows all 4 rock stars on the B&W cover. 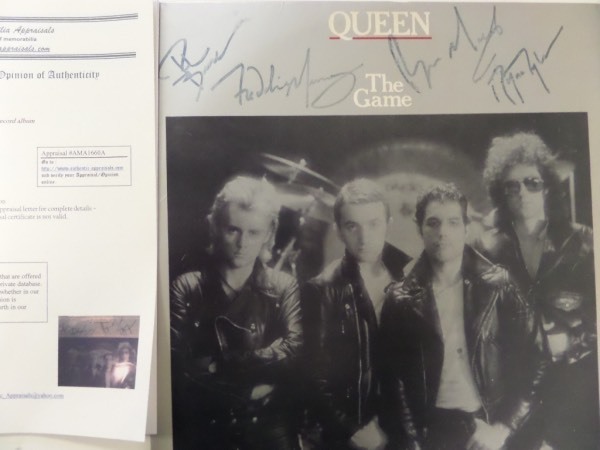 It is in great condition, comes cover signed by the late Freddie Mercury and his other 3 band mates in black marker, and an AMA LOA and appraisal accompanies. It is a $1200.00 rock n' roll must have, and signatures average about 6's or better overall.